Amazing real-time puzzle with real physics and pink bunnies. 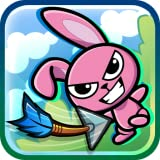 Cute and detailed graphics, watch random actions of the bunnies while they jump, fall, evade arrows and more! Great fun for any age, SIMPLE and PRECISE controls! FOUR WORLDS of PURE FUN, each one with 60 LEVELS of mind blowing challenges. COLLECT STARS - The more cunning you are, more stars you get!